Each year, the UMKC Alumni Association recognizes the achievements of outstanding alumni with an awards celebration. In 2019, UMKC Henry W. Bloch School of Management is honoring George M. Guastello II (B.B.A. ’82, MBA ’84) with their Alumni Achievement Award. 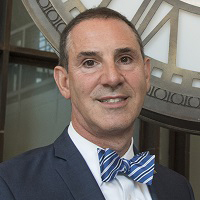 Guastello has used his extensive civic and business leadership experience to help lead the transformation of beloved Kansas City institutions including the Starlight Theatre, the American Royal Association and, most recently, Union Station. Since becoming president and CEO of Union Station in 2008, Guastello has attracted new tenants, hosted world-renowned exhibits and created an internationally awarded science center in Science City. He spoke with us about his passion for the Kansas City community. Why is the challenge of breathing new life into organizations so intriguing to you? I love the challenge and sense of responsibility to our community. So many memories have been and are created at these historic places. It is our duty to preserve and keep vibrant these important threads of our collective community. You’re on the Board of Directors for the KC Streetcar Authority. How has having the streetcar up and running affected visitors and traffic at Union Station? Union Station has always been a hub of transportation, so the streetcar has been a real win for us and the entire community. It drives tourism. It’s a legitimate commuter solution. And it has served to spur even more growth along and around the line. When the streetcar expands and connects to UMKC, a direct downtown and student/educational link will be in place, fostering even more growth and opportunity. What else is planned for Union Station? Our latest undertaking is our Early Learning Initiative for Science City. It includes the 13,000-square-foot reimagined early learning experience designed for the entire community. It will shape future generations in a profound way. How did UMKC contribute to your success? UMKC instilled in me an appreciation and passion for entrepreneurship. My professors challenged me to think outside the box and I was able to put into practice what I learned. Guastello will be honored at the 2019 UMKC Alumni Awards on March 15. Proceeds from the event will support student scholarships. In the last decade, the Alumni Awards events have raised more than $1 million in scholarships and immediate aid for students.